Key stakeholders ( i.e. 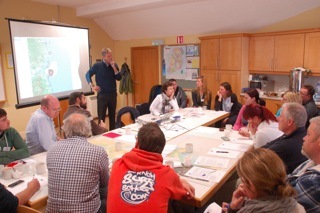 NPWS, ISPCA, East coast county councils, etc) were invited to attend a days awareness and management training. Looking at the challenges presented in the event of a serious pollution incident and how the various stakeholders could interact and cooperated to provide a cohesive response for wildlife. Attendees on the day included representatives from Louth, Meath and Wicklow County Councils, NPWS, Coastwatch, Birdwatch Ireland, and Kildare Animal Foundation. The course was provided by Sea Alarm and OWRN and sponsored by the Irish Coast Guard.